Serena Williams and Novak Djokovic at the Champions Dinner at the Guild Hall at Wimbledon on July 12 in London. Serena Williams had a remarkable 2015. The No. 1 player in women’s tennis won the year’s first three Grand Slam tournaments, lost just three matches — one of them the semifinal of the year’s last Grand Slam — and was named Sports Illustrated’s Sportsperson of the Year. Novak Djokovic doesn’t have as compelling a story as Williams does. His didn’t include the confronting of racism and sexism or a gracious return to a tournament where fans had yelled slurs. On the court, he didn’t win four majors in a row, didn’t have a chance to win four in one year, didn’t succeed at an age when most players have retired. He also didn’t have as good a win-loss record: He won 93 percent of his matches, and Williams won 95 percent of hers. He did it in his prime, while she’s an outlier for even being active at her age, let alone dominant. But Djokovic had, by just about every other on-court measure, a better year. Like Williams, Djokovic won three Grand Slam titles, and unlike her he reached the final of the fourth. He won 11 of the 16 tournaments he entered, reaching finals in four others. Williams won five of the 11 events she entered, losing in three semifinal matches and withdrawing from three other events. Djokovic also faced much tougher competition; he won 31 matches against the top 10. Williams won six. My colleague Greg Garber shares those and some of the other numbers that make Djokovic’s case at ESPN.com. At FiveThirtyEight, we have a measure that makes this sort of argument less subjective. We’ve adapted a rating system called Elo to rate teams in the NFL, NBA and MLB, taking into account both how well competitors do and the strength of their opponents. We calculated tennis Elo ratings at the start of the U.S. Open this year. At that point, Williams hadn’t reached her own top form of 2003, the first time she won four straight Grand Slam titles. She also hadn’t reached the peaks of Steffi Graf, Monica Seles and Martina Navratilova. Djokovic, meanwhile, was flirting with the highest level ever achieved by a man in the Open era — he briefly attained it at the French Open, only to fall back when he lost the final to Stan Wawrinka. Since that last check-in, however, the trajectories of Williams’s and Djokovic’s seasons have diverged sharply. We’ve run the numbers through the end of the year, and Djokovic has topped the all-time charts since the start of the Paris indoor tournament last month. Today he leads Bjorn Borg’s highest rating — attained after his 1980 U.S. Open semifinal win — by 12 points, and Roger Federer’s highest — which he reached just after winning the Dubai title in 2007 — by 13. Djokovic has gained 36 points since the start of the U.S. Open, bolstered in the ratings during that time by his 12 wins against top-10 players — doubling Williams’s total all year. Williams, meanwhile, is below her pre-U.S. Open rating. Her five wins in that tournament were expected, but the biggest upset loss in modern women’s Grand Slam history was not. Djokovic and Williams started the year at roughly the same Elo rating. Williams improved by 16 points, an impressive gain over an already lofty baseline. Djokovic, though, improved by 53 points. Much of the narrative of the season is set for American fans by the flurry of media coverage before and during the U.S. Open. That process had mostly run its course by the time Williams took the court to play her semifinal on Friday, Sept. 11. She had lost just two matches all year and, to become the first player since Steffi Graf in 1988 to win all four of the sport’s Grand Slams in the same season, she would have to beat only two fellow thirtysomethings who had combined for zero Grand Slam finals. Djokovic was coming off disappointing losses in his last two events, wasn’t in contention for the Grand Slam and looked likely to face Roger Federer playing near his best in the final. 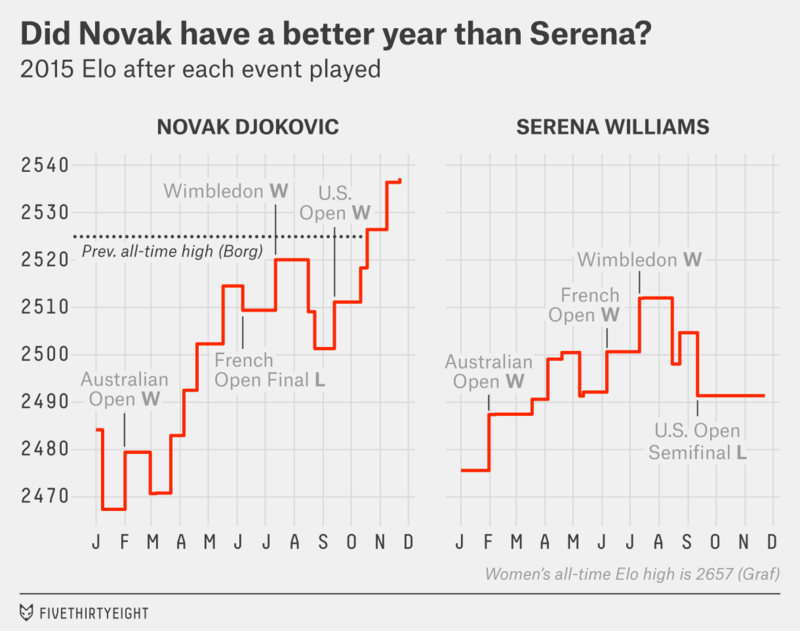 At that moment, Williams looked like she’d had the better year — she’d gained 32 Elo points to Djokovic’s 20 — and certainly the more historic and celebrated one. From that point on, it wasn’t even close. Williams went 0-1: She lost to Roberta Vinci and shut down for the season. Djokovic went 21-1. He lost just four sets and was pushed to a tiebreaker in just three others. But if you’d stopped paying attention by then — and you wouldn’t be alone; many Americans seem surprised to learn that the tennis season continues past the U.S. Open — then it would seem like Williams had the better year. Even if you care only about the majors, though, Williams’s 2015 still wasn’t quite as good as Djokovic’s. She was 26-1 to Djokovic’s 27-1. But she struggled more in victory, winning just 80 percent of sets to Djokovic’s 85 percent.2 She overcame this by winning nearly all of her close matches, but her ability to pull out third sets is fleeting if not lucky: It betrayed Williams in the U.S. Open semifinal she lost to Vinci, and Williams was just 2-4 in three-set Grand Slam matches in 2013 and 2014. If she is tougher in the third set of Grand Slam matches than in the first or second, it’s a newfound power. So why did Sports Illustrated coronate Williams and not Djokovic, and why did she get far more attention from U.S. media than he has? It helps that she and her sister Venus are the only active American players who are household names, and SI is an American magazine. But her season had other advantages. You can’t blame anyone for thinking that Williams’s winning of her 19th, 20th and 21st majors is a more momentous accomplishment than Djokovic’s winning of his eighth, ninth and 10th. Also the 28-year-old Djokovic is dominating at an age when the top men’s players normally dominate, while the 34-year-old Williams is dominating at an age when most top women’s players are either retired or on their way out. Before Williams, a player in her 30s hadn’t topped the rankings since Chris Evert 30 years ago. Today, the only player older than Williams in the top 50 is Venus. Djokovic’s year was better. Williams’s was more remarkable. Djokovic is playing at the best level ever, at least according to Elo. Williams is playing at the top of the contemporary women’s game, as well as the best level for her age ever. Djokovic had the better 2015, but let’s see if he can be as dominant in 2021. Though it would have been just 50 percent of the ranking points and 36 percent of the prize money if he’d won the French Open. Men at majors have more chances to run up the score in their best-of-five-set format than women do in best-of-three. But the serve is also more dominant in the men’s game, making it more likely for a favorite to drop a set in a tiebreaker because he couldn’t touch his opponent’s serve. It’s basically a wash, so it’s reasonable to compare set winning percentages.